The auction for # 001/250 of the Damascus Ice limited edition is now up on eBay here. Bid early and often. It is recommended that you also buy the sword through our site, in case you bid and do not win the auction, that way you have on to fall back on. In the case you do win we can just change your order and bill you the difference between the normal price and wherever the auction ends up. Currently at $1725. And still 6 days to go with approximately 200 “regular” Damascus Ice still remaining. Quite impressive. I wonder how much the original Damascus Longclaw #1 (of only 100) would now sell? I think it’s great that there’s people with the money and the desire to bid so much to own this sword. It shows how much interest there is in this line of weapons from the Song of Ice and Fire series. Hopefully it helps ensure the creation of future damascus versions of valyrian steel weapons like Oathkeeper, Heartsbane and Tyrion’s dragonbone hilt dagger, just to name a few. To the folks at Valyrian Steel, keep up the great work! There is no doubt that the HBO series has contributed to the popularity of this story and this sword. Like many of you, I read AGoT within the first few months and fell in love with the characters and weapons. I remember when Valyrian Steel announced they would be making official replica swords and decided then and there that I’d be a customer. I have all except for the Damascus Longclaw. I regret not purchasing that one so much, that I’ve already ordered Damascus Ice. It looks like this version of Ice will sell out in less than 30 days. I can’t tell you how excited I am to see ALL of the replica weapons that Valyrian Steel creates come to life, and more importantly, to see what they look like in my office!! 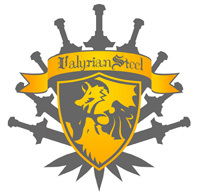 As Dominic says above, keep up the great work and thank you for doing what you do, Valyrian Steel! Out of curiosity, does anybody know how much Damascus Longclaw #1 sold for on eBay? Brian, as the PROUD owner of Damascus Longclaw #1 (the original Valyrian Damascus sword of only 100), you’d be surprised to know that I actually won (stole) this treasure (via eBay auction) in October 2009 for $809. Add shipping / handling and currency conversion, this masterwork only cost me $920 (Canadian)! Unquestionably, this is the closest I have ever come to winning a “lottery”! Wow Grant, that’s unbelievable! I never did follow the Longclaw auction. Now I’m definitely regretting it. Considering what you paid for 1 of a 100, compared to the damascus Ice, the HBO series has undoubtedly had a profound effect on the popularity of these weapons. What the $$$$?! Wow, that was definitely the deal of a lifetime. I’m actually speechless:) I can’t believe I made he mistake of not getting in on that back then. Wow!!! The times, they are a changin’, Ice has just gone through the roof. Yes Tomislav, you now get to move up one spot on the Damascus Ice pre-order list. Thanks mimir. Did #1 Needle get auctioned off or just sold? Will the #1 of future weapons that won’t have a damascus line get auctioned off? Unfortunately, Needle No.1 did not get auctioned. Alas, I had to settle for Needle No.2. We don’t plan on auctioning off any non-damascus in the future. They’ll just go to whomever orders first (as was the case with Needle and regular Ice). Regular Longclaw we did end up auctioning, only because we couldn’t find it at first.